Information From Town take Hwy 3 to Arcadia, turn R onto Hwy 334 to Wedgeport. Starting Point: End of paved road (Hwy 334); wooden signs “Sentier”. Description: Loop. Flat, grassy, rocky, wet spots. 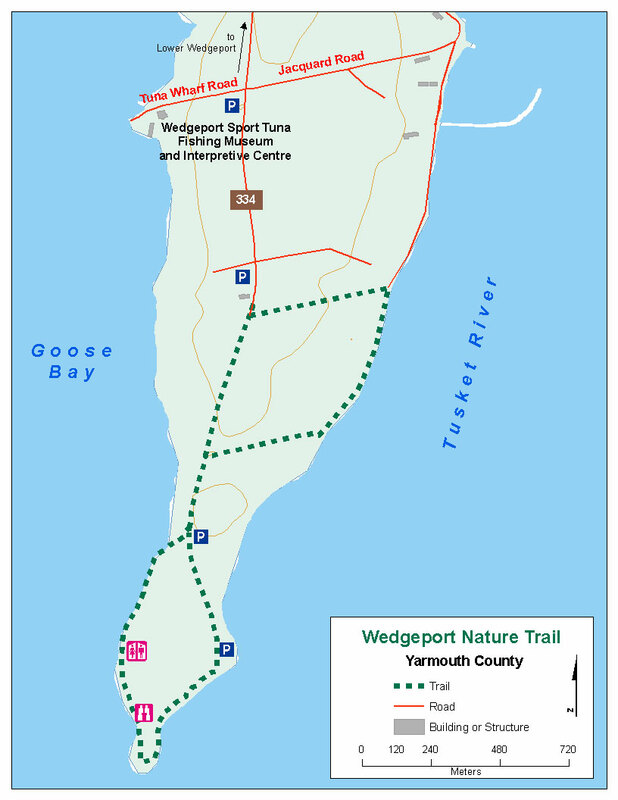 Trail goes E to shore, along shore, turn R to dirt road, cross over, trail to West shore, along shore to Wedge Point, ends on same dirt road, return to Parking. Attractions: Ocean shore E and W, wetland, muskrat houses, look-off, pebble and sand beaches. Services: None (Outhouse not in use). look-off areas. You can choose to walk the entire trail or do only a small section. Wooden trail markers point the way.